What supposed to be a silly April Fools' prank soon became a reality when men across the globe decided they need the Combat Kilt in their wardrobes. 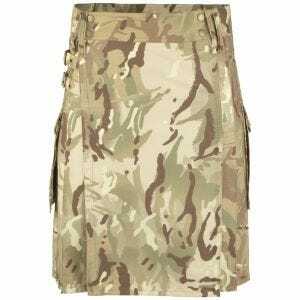 It's no wonder since this practical utility kilt not only looks and feel awesome but also performs great in almost every environment and circumstances. Durable and functional, it features overlaid kilt style front with snap closures, single deep rear pocket with a reinforced edge, flap and snaps, two side cargo pockets with flaps, snaps, external pockets and pen loops, and six wide belt loops to fit most tactical operator's belts. Moreover, there are two D-rings below the front belt loops which are perfect for fixing sporran, while the front belt loop includes a badge holder. Made of sturdy polycotton Ripstop fabric, Combat Kilt gives you superior comfort and freedom of movement. So don't hesitate, buy your Combat Kilt today before it's gone for good.